Summary: Although at times it gives the impression you’re watching some cut scene from a video game, they are well-shot breaks from what sometimes feels like a stuffy period drama. Historic Korean politics are combined with dramatic swordplay and a dash of fantastical CGI backdrops for an entertaining epic. Centred on Korea’s controversial national heroine Empress Myeongseong who was assassinated after fighting to keep her country independent of foreign influence, The Sword With No Name has a weighty subject matter and does it’s best to exhibit the story with grandeur. For the most part it succeeds, though there are moments when it seems the budget has been stretched too far or spent on occasional splashes of lavish special effects for the fight sequences. Essentially a love story set to a backdrop of politics, The Sword With No Name sees a young woman of noble birth (Su-Ae) embarking on a cross-country journey. While travelling she meets infamous bounty hunter Moo-myoung (Seung-woo Cho) who becomes her protector only for him to fall in love with her. 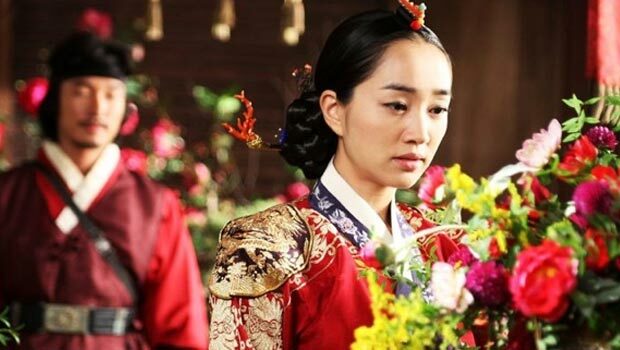 When the wandering girl fulfils a sacred promise by entering the royal court and ascending to the throne as Empress Myeongseong, she leaves behind Moo-myoung to lead her people. However, as she resists pressure from foreign powers to force their will onto her people, she becomes the target for assassination – though one bounty hunter, namely Moo-myoung, sets out to protect her and see out their love story. Asia’s history has long offered an excellent excuse to produce films with high production values offering the well dressed royal court in compromising political and personal situations, warlords spitting opinions at their sergeants and large-scale battle sequences. The Sword With No Name has them all and brings a tender love story to the fore as its driving force. Initially a sanguine and sweet tale, when the politics take hold there is a negative energy which sustains a sense of menace toward Empress Myeongseong despite the good she is doing for her people while her heart is never complete. Director Kim Yong-gyun balances the personal troubles with fantastical one-on-one sword fights set to CGI-backdrops such as one that takes place on a lake for added visual grandeur. Although at times it gives the impression you’re watching some cut scene from a video game, they are well-shot breaks from what sometimes feels like a stuffy period drama. But that’s not to say The Sword With No Name is dull – far from it. There is a careful handling of Empress Myeongseong’s reputation which gives the movie a lofty feel with the cast delivering serious performances that suit the subject matter. However, there’s a dryness at times that even the lush fight sequences can’t add flavour too and while there’s a dramatic conclusion, getting there can seem like watching a slow burning candle run out of wax. Praise has to be given to the filmmakers but there’s not quite enough swordplay for martial arts fans and unless you’re particularly keen to learn about the Empress, you might find this history lesson a tad stuffy.